Adding a pond feature to your lawn or garden not only adds a bit of beauty to your landscaping, but it can add to the value of your home as well. 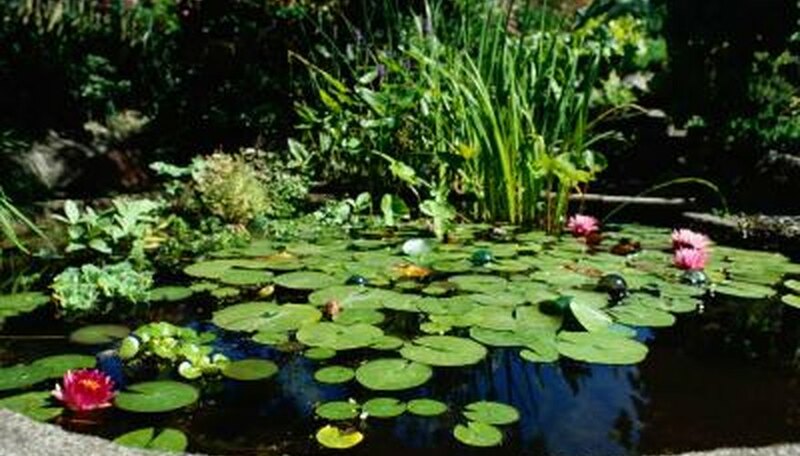 While most pond additions are in-ground, you can add a preformed pond above ground for a change of pace from the norm. Installation of an above-ground pond is a bit more extensive than adding the pond at ground level, however. It requires the construction of a foundation to keep the pond from sinking into the soil, as well as the building of a surround to hide the pond mold. Once it's completed, however, you’ll have a beautiful addition to your landscaping, a pond rising from a wall surround, just waiting to be filled with the fish or plant life of your choice. Determine the area where you wish to set up your pond. Place the preformed pond in that location to get a feel for the size and the look of the pond in its proposed surroundings. Mark out the position of the pond. Plant stakes into the ground surrounding the pond. Hammer them into the ground so the tops of the stakes are even with the lip of the pond. Tie string connecting the stakes around the pond’s perimeter approximately 2 inches off the ground, and then remove the pond from the location. Dig a hole for the foundation of your pond 8 inches deep within the staked off perimeter, using a spade. Fill the hole with 4 inches of gravel. Tamp down the gravel with a plate compactor to create a strong sturdy sub-base for the concrete foundation slab. Mix a batch of concrete in a wheelbarrow and fill the remainder of the foundation hole with a layer of concrete to ground level. Screed the concrete level, pulling a wooden board over the concrete in a sawing motion to lower high areas and fill voids. Make certain the concrete is level by laying a carpenter’s level across the surface. Make any adjustments with the screed, and then cover the foundation with a plastic sheet held down by stones around its perimeter. Leave the plastic in place for a week. Remove the plastic, and allow the concrete to cure for an additional week. Create a footer for your pond wall around the concrete foundation. Dig the footer trench 20 inches deep and 15 inches wide to support an 8-inch-wide wall surrounding the pond. Fill the trench with 10 inches of gravel, followed by a 10-inch layer of concrete. Level and cure the trench as you did the main foundation slab. Place the pond on the foundation, carefully centering it within the stakes. Build a stone wall around the preformed pond, using stones or bricks. Butter the bottom of each stone with mortar, using a trowel, before placing it atop the stone in the layer below to hold it in place. Fill the space between the sides of the preformed pond and the stone wall with backfill consisting of seven parts MOT — small stones and gravel — mixed with one part cement in the wheelbarrow, and then all mixed with water until slightly moist. Build up the wall to the rim of the pond. Finish the wall by placing one more layer of stones on top of the wall overhanging the pond edge. Allow the mortar to cure for 10 days, and then fill the pond with water and decorate the surrounding area however you wish. How do I Prevent Sand From Washing Away From Under an Above Ground Pool?